Have you got a large outside area that could do with a thorough cleaning to remove moss, mud dirt and slime? Need to get your yard, decking or patio cleaned quickly and professionally? Do you never seem to get the time to get it done? Don’t let the pressure get to you! Let us deal with this messy job! 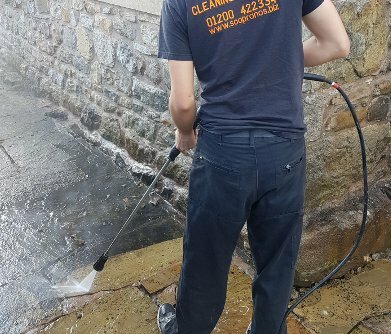 Soapranos are happy to professionally clean most outside areas to a high standard. In the unlikely event that you are not satisfied we will do it again! Please feel free to call us on 01200 422334 or, if you prefer, you can use our free call back service to discuss your cleaning needs.